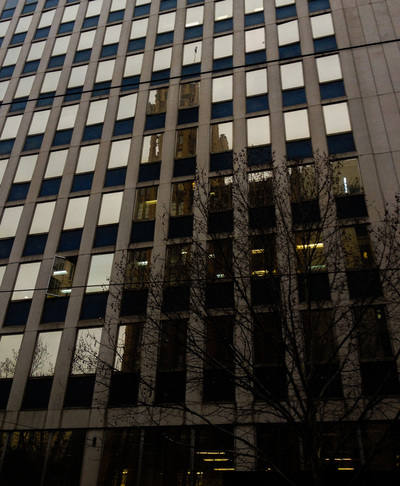 You really know you're in a big city when you see buildings reflected in each other. This can give a sense of being smothered, of claustrophobia where it feels like you are can't breathe easily. You feel surrounded by large buildings, some old and some brand new. The feeling of clautrophobia is heightened by the many people scurrying past. There are also noises from trams and cars, often accompanied by loud sirens. All of this can trigger a sense of panic. It's so easy to feel overwhelmed in a place like this. Or to feel energised and excited by it. If you look around you carefully, you begin to notice much more than buildings. You can see the inhabitants of the city. You notice people starting to emerge from their city dwellings, with bags and briefcases, ready for a day at work. If it's early enough in the day you might see street cleaners going about their never ending task of cleaning up the mess left behind by busy people from the day before. You can see the homeless community beginning to stir but maybe still sleeping, even with the noise around them. You wonder how they can sleep in such a place, surrounded by strangers, surrounded by noises of the city. This is their city and they have found a way to make it their home as well. There's clearly more than one way that people find to feel safe and comfortable They sometimes are accompanied by little dogs, with sad eyes looking up at you as you walk past. The city's buskers might be up and ready for their day, hoping to capture the interest of the people walking past on their way to work. Street artists could be ready to weave their magic on the foot path or in the lane ways just off the major streets. You have to look a bit harder for those in the lane ways. If you look above, way above, you might even see some early morning window cleaners. Going about their job from a great height. You can't help but wonder what it would be like to get up and go to work like that every day. Perhaps after a while it's just another job. Then there are the people who come into the city for their work day. They are the real scurriers - just passing through, not really part of the city. Using it to make a living. A necessity rather than a joy. This shows on their faces. Serious and business like, hardly noticing what is going on around them. Unlike the real city community who take things slower, know their place and look like they belong here.